Many students live in our on-campus student residence facilities to round out their Columbus Culinary Institute experience. Living in our student residence facilities is a great way to have a stronger sense of community, shorten your commute, make close friends, and experience living on your own. Students have the opportunity to make new friends as they share our fully furnished, two-bedroom, two-bath facilities. Culinary students also live in the apartment complex located adjacent to our campus. Students can easily walk to classes from this complex. 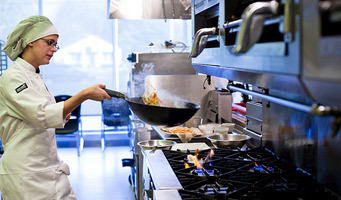 To find out more about our housing options as part of the culinary arts program, request more information today. Technique. Fresh Ingredients. A Passion for Cooking. Schedule your visit now!